I read a post, citing a series of establishment Presidential candidates who ran and lost, and so the author declared he would not support Romney, another establishment-backed Republican. And I agree and think Romney will most likely lose, too. I've watched and continue to watch him for years, and I can identify no operating framework of principle. His guide is a political wet finger. I posted a blog post yesterday about the absolutely absurd assertion that Gingrich is not a conservative. The implication is even more absurd: ...and Romney IS? 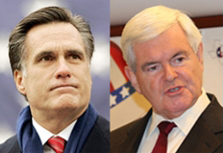 The establishment is frantic with fear that Gingrich could win the nomination and lose the election. It isn't a big surprise that they have it backward. Of course, Ann Coulter has been raving that Romney's the most conservative. At first I thought she must have some other motivation. But now I believe she's bought the fear that Gingrich could lose. For Ann Coulter with that fear established, it's kitchen sink time: she'll say anything. But today they've really called the dogs out. All kinds of unlikely conservatives are questioning Newt's conservatism and his stability. But plenty are also supporting him. I'd suggest those are the ones who care more about the truth and America's precarious state than the call to say any preposterous thing to sink Gingrich. Many are following Romney in asserting that Newt is not really a Reaganite. I have an idea! There's this guy who has endorsed Gingrich that you may have heard of. His name is Michael REAGAN! I told someone today that I would love for the Republican voters to refuse to follow, stick it in the establishment's ear and nominate Gingrich. Hey guys! It's OUR party, not yours. The establishment opposed Reagan, and the people chose him anyway: two landslides. I hope they do it again, and it's the establishment that has to swallow hard. If it gets worse, Gingrich should outright say that his values are Republican, but he's running against the establishment of both parties, neither of whose priorities are: Take the party back!